PEDIGREE® DentaStix® can reduce tartar build-up by up to 80%, which can help reduce the risk of periodontal disease. PEDIGREE® DentaStix® can reduce tartar build-up by up to 80%, which can help reduce the risk of periodontal disease. Their special texture, unique x shape, and clinically tested active ingredients help keep your dog's teeth and gums healthy and strong. 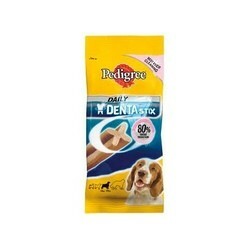 DentaStix® come in three different sizes - for small, medium and large dogs. They are an easy way to keep your dog's dental health in check, and each time you feed your dog a DentaStix®, you can see how much they enjoy them.